During my time as a Commonwealth War Graves Commission Centenary Intern, from April to August 2018, I sought to try and find a way to connect with and better tell the stories of the 72,000 soldiers on Thiepval Memorial to the Missing of the Somme. Before my first month at Thiepval had gone by, my opportunity came. I met David Balaam who was looking for his wife’s friend’s relative: Second Lieutenant Ashley Waterson McGain. He’d served with the Suffolk Regiment and had been killed on 1 July 1916 while fighting near La Boisselle. He was 23 when he died, my age when starting the internship. I had never read anything like it before and was not prepared for how close it seemed to bring me to a young man whose full life had been tragically shortened. Born in 1893 at Port Erin on the Isle of Man, Ashley was educated at King William’s College where he joined the Officer Training Corps. His education shines through in that his letter is dotted with Greek and Latin phrases. Prior to joining the army in September 1914 he had worked as a schoolteacher. After reading the letter once I felt as if I knew the young man who had written it. The love for his family, his passion for music, hunting and sports and his generous spirit were all revealed to me in his own words. It made it all the more painful to know that he hadn’t survived, but at the same time, all the more remarkable to be able to read the letter where his feelings for all that he held dear remained, as vivid and meaningful as when he had first written them over a hundred years ago. I instantly felt that I wanted to tell Ashley’s story; I asked David and his family for permission to use the letter while taking people on tours of the memorial, a request which they very kindly allowed. Even when reading Ashley’s letter to the other interns, I found it hard to fight back tears and the powerful effect of the letter was not just limited to me. It affected many of the visitors, including John Hardy and his wife Alison on a tour of the memorial, who were both extremely moved by it. This prompted them to show me the last letter from John’s Great Uncle John Henry Hardy. Twenty-three year old John Henry came from a family of coalminers near Wakefield. He arrived in France on 21 May 1915, becoming a signaller in the 10th Battalion, King’s Own Yorkshire Light Infantry. 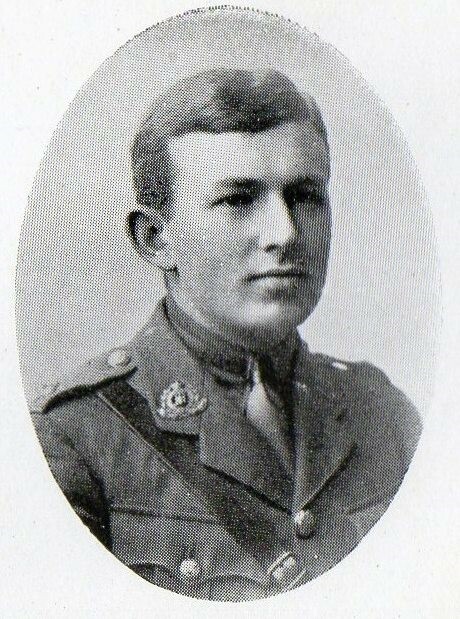 He was a Lance Corporal when he was killed on 16 July 1916 near Bazentin, most likely during an enemy artillery barrage. Henry’s letter, in its matter-of-fact way, reveals the worries he has for his family, while voicing the opinion of many of the soldiers in hoping that the fighting would be over. Henry Hardy’s sick mother died not knowing that her son had been killed. Thiepval Memorial represents those who are missing in all but name, those whose bodies to date, have not been found. The two pencil written letters gave me and others a way to connect with the men on Thiepval. The words of Ashley and Henry, in voicing their hopes and fears, perhaps represent the feelings of many named there, providing a link with each and every man. They may no longer stand before us, but their words and sentiments remain as clear as they were when they first wrote to their loved ones. We are privileged to hear their voices in their last message home. I’d like to thank the family’s who kindness and generosity in introducing me to their relatives, commemorated at Thiepval, helped to show just how much a letter can reveal. The 2019 CWGC Internship is now open for applications. Visit here for more information or to apply.